When an airline begins service with a new plane to a new destination, it's customary for the airport fire trucks to come out and welcome the flight with a water canon salute. 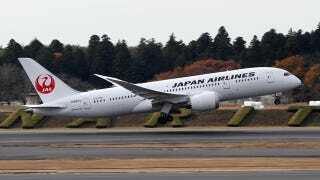 But when Japan Airlines brought their Boeing 787 to Tampa for the first time last week, something went very wrong. Last Thursday, after landing in Tampa, the Dreamliner was taxiing to its gate beneath a water arch formed by the canons of two airport fire trucks. The plane's right wing struck the boom on one of the trucks - which according to airport officials was "out of position." JAL spokeswoman Carol Anderson said repairs were completed by the airline's mechanics, though a small fix would remain to be completed upon arrival back in Tokyo. Youtube user Nimbus811 caught a video of the plane's departure after its 3-day repair in Tamps, and says the plane had been chartered to carry Japan's World Cup soccer team.